What They Say....For the first time in decades I’m remembering Mom, all of her--the wonderful and terrible things about her that I’ve cast out of my thoughts for so long. I’m still struggling to prevent these memories from erupting from their subterranean depths. Trying to hold back the flood. I can’t, not today. The levees break. What I Say....This was an engrossing read. And perfectly timed for Mother's Day. The author is one of three daughters to a complicated woman. Alice's mother sounds like she was part of the generation that had just started to question the way woman were treated in the world, and in marriage in the eyes of society. I've always thought this had to be one of the hardest times in the world to be a woman. Now add in her fight for civil rights, along with the semi-overt anti-Semitism in their own neighborhood, and I can see why her mother seemed withdrawn and angry. I had heard a bit about the DES daughters, but it was eye opening to see that this affected three generations in this family. To see the "cure" for a miscarriage continue to cause health issues and infertility was heartbreaking in it's irony. I can totally identify with the way the author beat herself up for not being the perfect mother, the struggle with depression, the wanting to take your child's pain on yourself. I think most mothers can. But as she learned from her mother's visits, everyone does the best that they can with the tools that they have. And if you are doing the best you can and you truly care, that is what your kids will eventually see. At first read, her mother's sudden death after finally declaring herself to be the happiest she's ever been was crushing. But after I had time to think about it, how wonderful that she had the chance to experience that happiness before she passed. How awful would it to be to die unhappy? Motivation for all of us in the thick of motherhood's stressors. Thank you to Booksparks for the review copy! 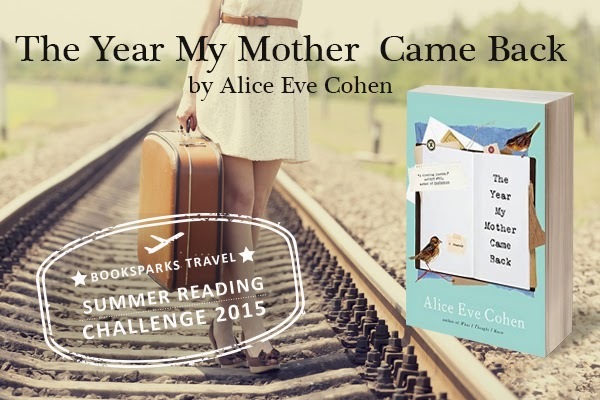 I'm happy to be part of the Summer Reading Challenge 2015!